I have small pockets of time I can spend getting things done out at the Yard, and last weekend was no exception. My plan was to get the AC 120V outlets wired up. Not really critical to launch, but fairly easy and the aesthetics of closing up the box holes in the cabin would please me. The first thing I did was to take a terminal screw out of the GFCI to check to see if it was a #10 or #8 terminal. After determining that it was most definitely a #8 screw I set about crimping three #8 terminals onto the line side wire. And then came the frustration. I tried and tried to get the screws back into the GFCI, but couldn't do it. It turned out that there is very little clearance for re-engaging the screw in the GFCI, and the heat shrink tubing ate up about 1/16", which was just enough to keep the threads from hitting the plate. It looks like I have two options:  Obtain longer screws for the GFCI, which will most likely risk causing other problems. Use fork terminals. If I'd done this before or had properly researched the task I would have realized that the screws really aren't meant to come out of the outlets. They are meant to be captive. 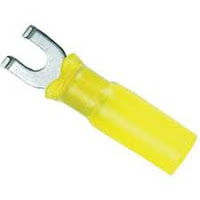 With that in mind, I realized I'd need to obtain a package of #8 fork terminals for 12-14AWG stranded wire. Unfortunately, that means a trip to West Marine, and that would have eaten up about 50% of my remaining work time. So, no luck on finishing that project. I'm going to try to pick up the terminals this week so I'll be ready for a weekend installation. Hopefully the second time will be a charm.